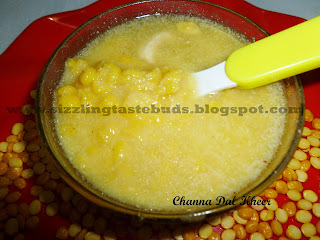 Channa Dal or Bengal Gram Kheer is an unique and delicious traditional kheer prepared mostly during festival season. Here the recipe of yummy Channa Dal Payasa/ Kheer. 1. Wash and soak channa dal for atleast 30 mins. 2. Pressure cook this soaked channa dal till it becomes soft. 3. Meanwhile grind the grated coconut with water to a paste and strain thick coconut milk and keep aside. 4. When the channa dal is cooked, slightly mash them and add jaggery and mix well and cook it in a low flame till jaggery blends well. 5. Pour coconut milk to the channa mixture and bring it to a boil or till the kheer thickens a bit. 6. Remove the kheer from the flame and shift it to the serving bowl. 7. Garnish with ghee roasted cashews and raisins. 8. Delicious Channa Dal Kheer/ Payasa is ready to serve. The kheer thickens when it gets cold and the taste gets better too. This Kheer goes very well with Pooris. Enjoy this delicious kheer and let me know your feedback.